Though it is free to use, Win93 is copyrighted software. Please read the License Agreement. Win93 is a Windows "GUI" application for the Radio Shack Pro-93 trunking scanner. 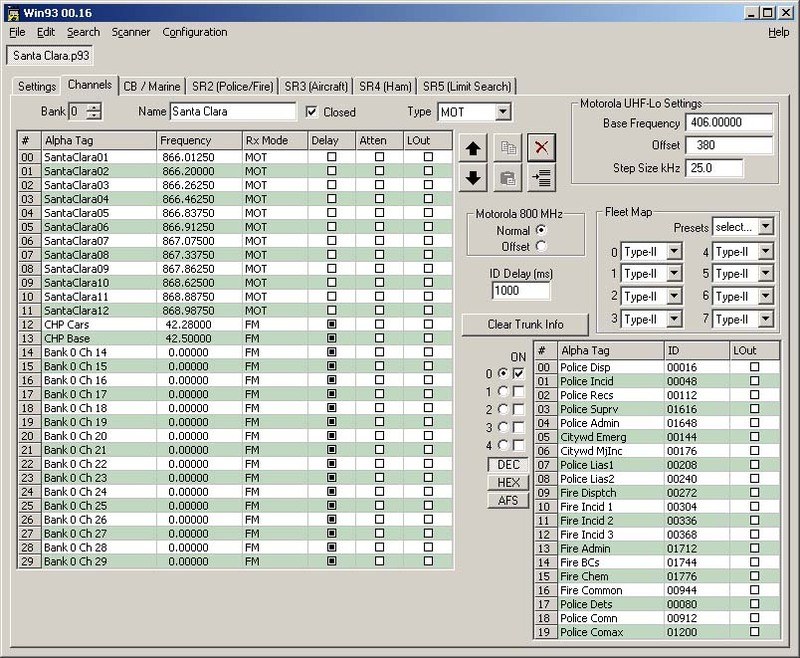 It allows you to read data from the scanner, make changes via the GUI, and write the modified data back. It will read / write the scanner in less than 60 seconds. You can maintain a "library" of data files to be downloaded or shared. Win93 uses the 'standard' P93 data format for its files, as well as a text file format that can be used for printing or manual editing. As of version 00.23, Win93 allows you to enter any frequency between 5 kHz and 1.3 GHz, excluding the cellular ranges. This fills the "gaps" in the PRO-93's coverage (e.g. between 54 MHz and 108 MHz). For ranges below 460 MHz, the step size is 5 kHz; for ranges above 460 MHz, the step size is 6.25 kHz. This feature can only be used in programmed channels - it does not work in the user-defined Limit Search (SR5). The scanner makes additional checks for "valid" frequencies. It has to, so that it can jump between its valid ranges as it's scanning. UPDATE! You can search through the Extended Ranges! Using Win93, program an out-of-range frequency into some channel. On the PRO-93, select that channel in "manual mode". Press FUNC TUNE. The scanner will no search up (or down) from that frequency. If you let it enter a "valid" range, it won't go back to the invalid range, so you'll have to select the channel and hit FUNC TUNE again. NOTE: There has been an item sold on eBay that claims to "unlock" the frequencies in the PRO-92/2067, PRO-93/2053, and PRO-95. I have been informed that this item is merely a set of 151 .P95 files (for use with my Win95 app). Together, these files contain all of the frequencies in all of the "extra ranges" as added by Win93 and Win95. One could create this data himself by using a program like Microsoft Excel to fill columns with incremental frequency data, then copy and paste to Win93 or Win95. Instructions for doing this can be found at this link. Reception in some ranges may be affected by filtering and other characteristics of the scanner. For example, while the scanner will tune and receive commercial FM broadcasts, reception will be distorted. FM broadcasts are wideband, while the scanner is a narrowband receiver. NOTE: This does not enable any cellular frequencies. The scanner appears to block any such frequencies. If you're interested in the various cable, CPU, and serial port configurations, there is a table here that is a compilation of reports from users. NOTE: As of 12 Feb 2002, this page now includes a list of pro93.com cable purchase dates, adapters, and status, as reported by users. The link above is the program only - it doesn't include a couple of system files that are required to run it. If you're using a recent version of any Microsoft product, then you should already have these files. If Win93 complains that it can't find a file or component necessary to run (or something like that), you can get the required files in this ZIP file. Merely extract the DLLs into the same directory/folder where you put the Win93.exe program. For cables - I would recommend the "Casio cable" available from Purple Computing. You'll also find there the Radio Shack part numbers for two adapters you will need. Everybody I've heard from has had great success with this cable/adapter combination. Some computers may not like this type of cable - since the circuitry in the cable draws its power from the lines in the serial port, the computer's COM port must be able to supply a certain amount of current. Some computers can't supply enough power on their serial port lines. For such machines, the only alternative is to build a self-powered (uses batteries) cable. Schematics for these can be found in the Yahoo PRO-92 group. Fixed a bug that would cause 'erasure' of bank 0 channels 19-25 in one file when you saved another file. Fixed the slow upload time when using a one-way cable. Added the ability to enable or disable the "serial readback" function that was added the previous release. If you use a one-way cable or another cable that gives you a "readback error", uncheck the new box in the Serial Configuration window (Configuration -> Serial). Added another copy test in the Bank Editor, so that you cannot copy to a bank that is already being copied to another bank. For example, if you are already copying Bank 0 to Bank 3, you cannot copy Bank 5 to Bank 0. The serial I/O code (upload, download, verify) is now able to determine whether the scanner is connected or not. If an incorrect COM port is selected, an unsupported cable is used, or the scanner is not powered ON, an error message will be displayed. IMPORTANT: If you are using a one-way cable, DO NOT DOWNLOAD THIS VERSION. Added a Bank Editor function. You can move, copy, and clear banks in a few simple steps. The new function is on the Edit menu, and can also be accessed via Alt-B. Fixed a bug in the handling of "zero" frequencies (0.00000 MHz). Fixed a bug in pasting external data to the frequency list. Changed all of the "text" edit controls (Bank Name, etc.) to use a fixed-pitch font (Courier). Added the ability to select the fixed-pitch font for use in the Alpha Tag fields of the various grids. New items in the User Interface dialog for control of the above two options. Code consolidation related to Win92 upgrades. Fixed a bug in the 'move up / move down' code. If you were editing an alpha tag, frequency, or talk group ID (such that you had the blinking cursor in the edit field), and you tried to move the entry up or down, Win93 would crash. Added the ability to program frequencies outside the PRO-93's normal ranges. All frequencies below 406MHz use a 5kHz step size, while all frequencies above 406MHz use a 6.25kHz step size. Test results for the added ranges are here. NOTE: This does NOT unlock cellular frequencies. Fixed a bug in the switching between talk group sub-banks. If an invalid entry is found, then that entry and all after it were copied from the old sub-bank to the new one. For example, if editing in sub-bank 1 and ID #04 is in valid, and you select sub-bank 3, then sub-bank 1's entries from ID #04 through ID #19 were copied into sub-bank 3. Changed the "Warn on Duplicate Talk Group IDs" feature so that it ignores ID values of zero. If you were editing an ID, changed the value to zero, and then completed the editing process (TAB, Enter, mouse click, etc. ), the program would complain that the zero entry was a duplicate. Changed the "Warn on Duplicate Talk Group IDs" feature so that it checks all sub-banks in the current bank. It used to only check the current sub-bank. Miscellaneous cleanups. A few rendering optimizations, in preparation for Win92's "updating". Added the ability to control the "seek search mode". This is the mode that is entered when you press FUNC 7 while in Search mode. See page 36 of the manual. Fixed the creation of "default" channel alpha tags when you create a new template. Added the ability to control the "sub-bank on/off mode". This is the mode that is entered when you press FUNC TRUNK while stopped on a voice transmission in a trunked system, and which lets you turn sub-banks on and off (see page 61 of the manual). This feature has been added to take care of the (rare?) cases where you get a P93 file that seems "stuck" in this mode. If you turn this mode on from within Win93, you'll see a display similar to "T IDbk 01..." in the third line of the display when the scanner stops on a voice transmission. You can temporarily get back to "normal" display (channel alpha tag) by pressing FUNC TRUNK when the scanner stops on a voice transmission (this will only last until the next time you power-cycle the scanner; after that, it will return to the "T IDbk 01..." display). Added the ability to search for Talk Group IDs (in addition to frequencies and alpha tags). Note that since the interpretation and display of Talk Group IDs is dependent on the bank's trunking mode, this is really only useful for looking for an existing ID in the current bank. For example, if you have a MOT-II bank and have an ID there of 1616 (decimal), then searching for 1616 in another bank that is set to "Conv" (not trunked) won't find the ID in the MOT-II bank. Because of the way IDs are stored in the scanner (and in Win93), you'd have to search for ID 101 from the "Conv" bank. Fixed a problem with searching for alpha tags in Talk Groups where it would only search in the first sub-bank, and would highlight entries in the wrong (current) sub-bank if it found a match in sub-bank 0. It now looks through all sub-banks and highlights the correct one. Added a warning message if you enter a duplicate Talk Group ID. It only looks in the current bank (obviously) and in the current sub-bank (because of the cases where you might use "overlapping" sub-banks). You can turn the warning on/off via a new item in the Configuration menu. Moved them serial configuration menu items into their own dialog box, so that I could allow COM ports from 1 to 256. This has been tested with the three USB adapters I bought - I am able to select any COM port from 4 to 256 (1 to 3 are already used on my laptop) for any of the USB adapters. Rewrote some of the serial read/write code. Now works with the Belkin F5U012 USB->Serial adapter. Fixed the tool tip on the "move entry up" button. The DEL and INS keys now perform the functions of the "Delete Item" and "Insert Item" buttons on the Channels page. Added items on the Edit menu for Insert, Delete, Move Up, and Move Down functions. Fixed a bug in the Trunk ID handling where entering data into the 19th ID of any bank or sub-bank would cause the program to crash. Fixed a bug in channel alpha tag handling that would actually shift the tags up by one channel in the scanner's memory map. Added a delay option to the upload code, in order to support certain USB -> Serial converters (specifically, the "IOGEAR GUC232A USB PDA/SERIAL ADAPTER"). Fixed a bug that could cause a crash if you tried to use a serial port that didn't exist. Data-entry grids now only "grow" enough to show their data. This is to eliminate the ugly blank space at the bottom of the list. The grids will be resized correctly (grow/shrink) if the row height is changed via Configuration -> User Interface. Added the ability to control the display format (Alpha Tags or ID Code) for Trunk IDs (Bill found the controlling bit). This should take care of the text vs. code problem that was discussed in the Yahoo group thread "Toggling Between Text and ID's", started by Phil on Wed Feb 13, 2002 9:05 pm. It sounds like Phil had set the ID mode then downloaded to the PC. The resulting P93 file had "ID mode" set. This is now controllable on the "Settings" page in Win93. Fixed scrolling limits for smaller (e.g. 640 x 480) displays. Repaired the lost tool tips on the Channels page. Limited all Alpha Tag data entry to 12 characters. Allowed horizontal resizing, stretching and shrinking the grid controls and relocating all other controls in the process. Changed the "Maximize" code so that it a) won't get too big horizontally and b) centers the window horizontally on the screen. Allow vertical resizing of the main window beyond the previous maximum. You may now increase the vertical size to the limits of your display. All of the lists in all of the pages will grow accordingly. This will allow, if you have a large enough display, viewing of all channels and talk groups without scrolling. Enabled the "Maximize" function. Since resizing in the horizontal direction beyond the predefined maximum is not (yet?) supported, you may end up with a bunch of blank space on the right side of the window after maximizing. Don't ask when I'll support resizing horizontally - it's a major PITA and I'm not sure I'm going to do it. The program will now remember its position and size on the screen, so that if you've done any resizing, you won't have to do it every time you run the program. The "restored" (non-minimized, non-maximized) position is saved, and that's how the program will come up the next time. Fixed a bug where I wasn't properly handling the column sizes (the new Grid Controls all have one more column than the previous versions, and the INI file didn't have a width value for the new column). Fixed a bug in the Frequency Search, where it would truncate trailing zeroes in the entered frequency, causing more matches to be found. Rewrote / replaced all of the data grid code (this is the code that handles entry and display of alpha tags, frequencies, etc.). Details on the usage of the new display can be found here. Added retry logic to the Download code - will now make up to 5 attempts to trigger the download before reporting an error. Added tool tips to the buttons on the Channels page. Changed the text file format so that it can be used in Windows Notepad and other editors (changed LF characters into CR/LF pairs).